They really should call this mod Tail as Turn and Turn as Reverse. That makes more sense to me than Tail as Turn + Backup. This mod turns your factory Tail light into a turn signal and then turns your turn signal into a reverse light. However you want to chalk it up, this is a cool little mod. Make your LED tail light also function as the turn signal on your 5th Gen 4Runner plus an option for backup light (reverse lights) with the Diode Dynamics Tail as Turn Mod. 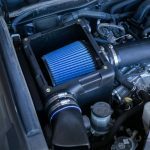 There are a lot of different modifications you can do to your 5th Gen 4Runner, however, some will help you both off-road and on-road. 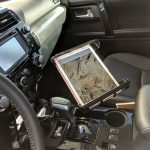 These types of installs are the most bang for your buck because you can utilize them in your day to day life and also when you go off the beaten path and hit the trail. One such multipurpose upgrade is lighting. 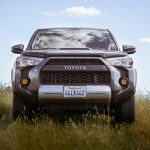 There are many different lighting upgrades you can do to your 4Runner, but potentially the most needed improvement is the reverse lighting. I don’t think it is a secret that the stock reverse lighting needs improvement and makes it hard to see behind your 4Runner when reversing in low light situations. Stock Reverse lights on 4Runner are not Bright! From my experience, I would consider the stock reverse lighting as almost dangerous, as it can be very difficult to see what is behind you. I think the idea is for the stock reverse lighting to aid the reverse camera, and therefore the reverse lighting doesn’t emit too much light to the sides. If you prefer to use mirrors you will want to upgrade your reverse lighting. Simply replacing your reverse bulbs with some LED’s will make a small improvement in lighting, but in my opinion, this will really only benefit you in visual appeal as not much improvement in visibility can be seen in my opinion. After replacing the stock reverse bulbs, the most immediate idea would be mounting two external lights on your bumper. Although this would create a large improvement in lighting, it requires mounting lights, wiring, and typically isn’t very cheap. 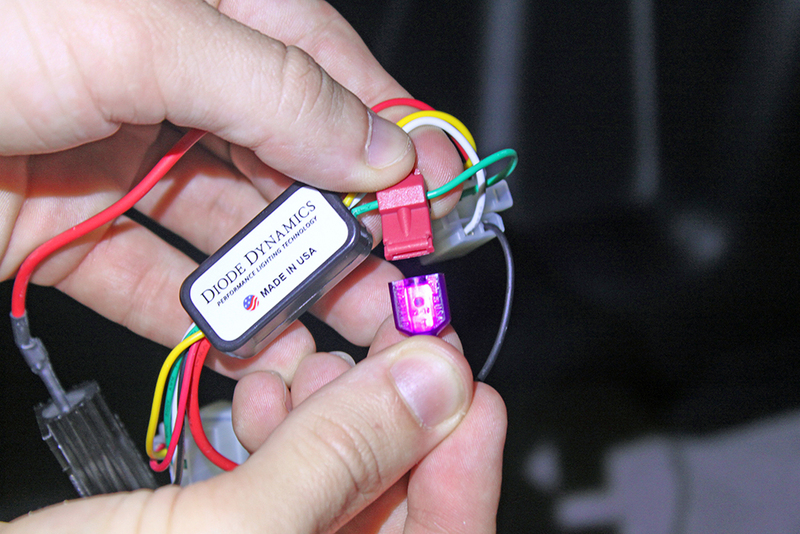 There is a solution that can help you out quite a bit without any drilling and nearly a plug and play install, the Diode Dynamics Tail as Turn Module. The Tail as Turn Module from Diode Dynamics essentially reroutes electrical signals so that your stock LED brake light will function as a turn signal and your existing turn signal will operate with your reverse lights. You do need to replace your turn signal with a white bulb – preferably an LED bulb for optimal performance. I suggest purchasing your LED bulb that replaces your turn signal bulb from Diode Dynamics. They offer three different bulbs with different outputs and costs. In consideration that the stock backup bulbs are 250 lumens, here are the bulbs you can get to replace the turn signals to make them function as a reverse light with the Tail as Turn Module. HP48: 280 lumens. SMD LEDs arranged radially. HP11: 310 lumens. LED panels in an aluminum housing. XP80: 510 lumens. High-power chips in an aluminum housing, designed for maximum output. Cost varies on each of these bulbs, but I would suggest purchasing the XP80. 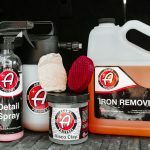 If you are going to spend the money to do this install I think it is wise and well worth the investment to spend a little extra money for the maximum output possible. If you go with the XP80 you are more than tripling your reverse light output. You really are doing even more than this though, as the lens that is used for the turn signal will help to spread light more efficiently and out to the sides of your vehicle. The XP80 uses less than 6 Watts in comparison to the nearly 25 Watt turn signal bulbs, so there is no need to upgrade your wiring either. I also think it would be well worth purchasing a LED reverse bulb if you do not already have one. By doing so, after this install, you will have completely LED tail light assemblies. For the sake of the photos you will see in this install, I already had Sylvania Zevo 921 LED reverse bulbs installed, so output and visual appearance may differ depending on your current setup. In the case you do not already have LED reverse bulbs and would like to switch to LED bulbs, this can be completed easily and with little additional cost. 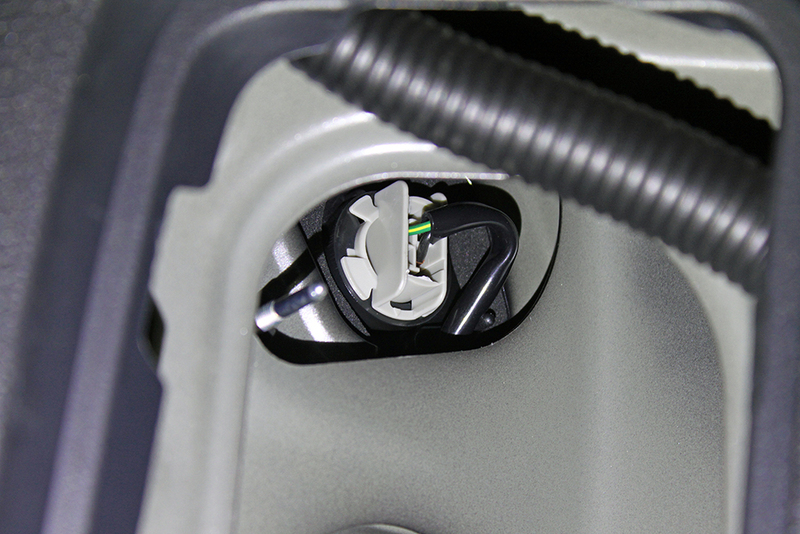 Amongst the performance of the Turn as Tail Module is also the reliability of Diode Dynamics. You will have a three-year warranty and excellent customer service from my personal experience with any questions I had. 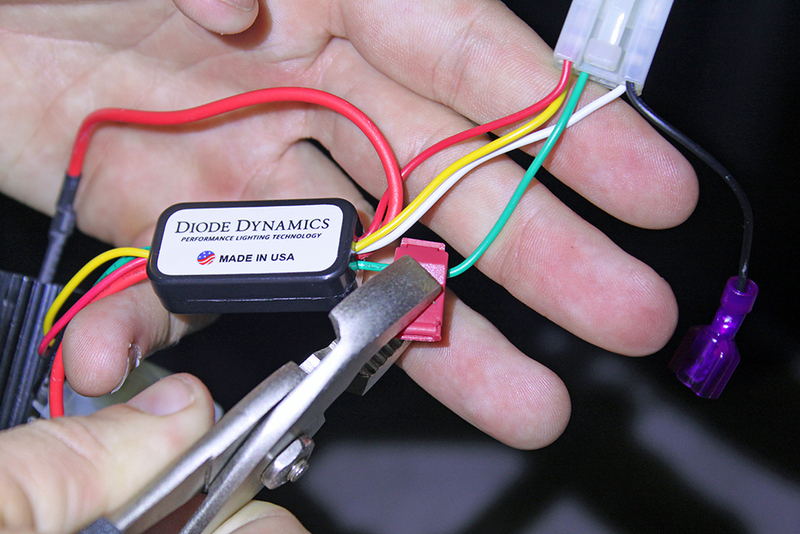 On top of all this, Diode Dynamics is made in the USA! 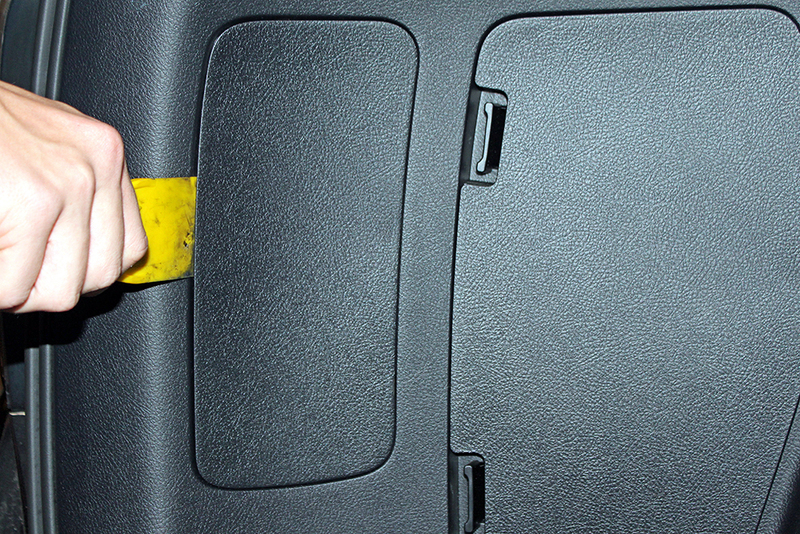 Remove the cover in the cargo area of your 4Runner that provides access to the rear taillight assembly. You can do this with a plastic pry tool. There is a small notch near the bottom corner of each cover. This is a great spot to utilize your pry tool and the cover should pry off without much effort. 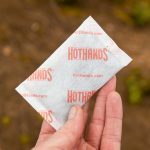 You can use your hands to pull the cover off after initially popping the cover loose from its tabs. Diode Dynamics suggests removing the taillight for this install, but I have completed the install without removing the taillight. This can be removed by depressing the tab on the clip and then pulling back towards your body. This is located at the very top of the open cavity and can be removed by twisting the turn signal light assembly counterclockwise. After removing the turn signal wiring, go ahead and remove your stock turn signal bulb. Replace your old turn signal with your choice of LED bulbs from Diode Dynamics. For the sake of this install, I used the XP80. 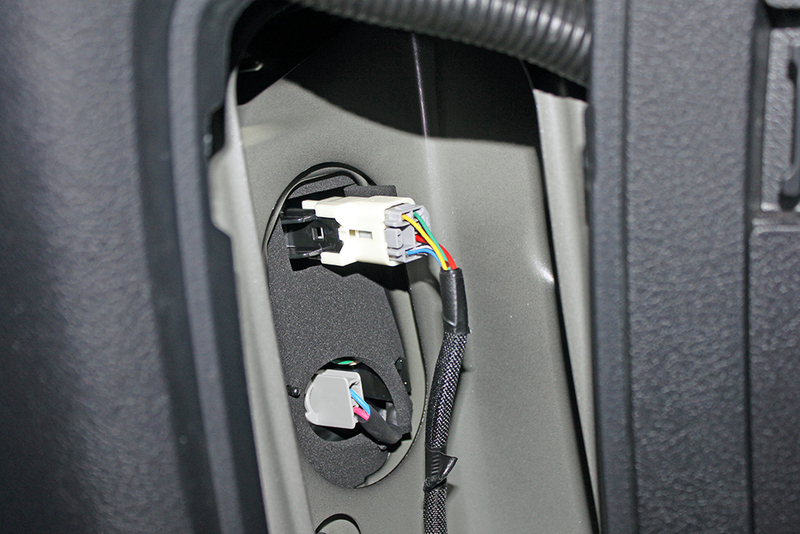 To install the new bulb, simply push the bulb into the light housing connected to the turn signal wiring. The bulb is polarity sensitive, so don’t install the assembly back into the turn signal housing yet as you will need to check the polarity. 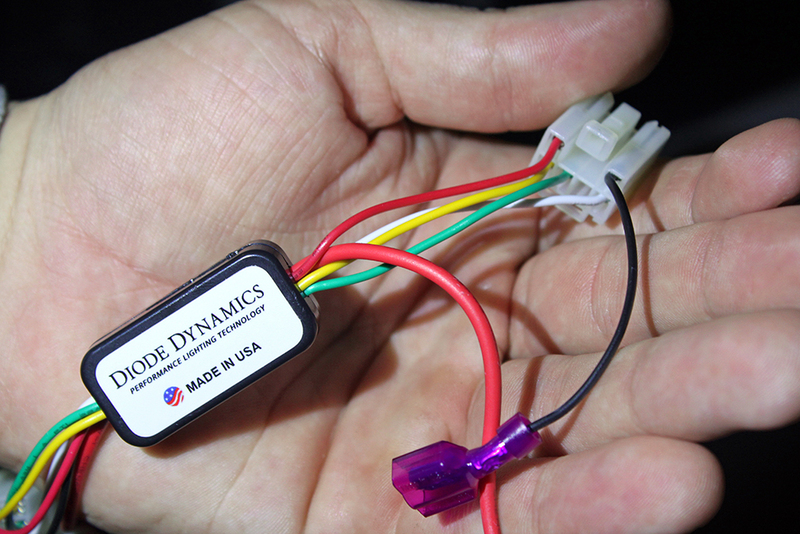 Now you need to install your Diode Dynamics Tail as Turn Module so that your stock LED brake light will function as a turn signal, and your old turn signal will work as an additional reverse light. 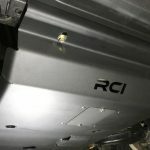 In order to make the module work for an additional reverse light, you need to use the included wire splicing clip and attach this to the green wire on your module. Make sure the green wire is centered in the channel of the wire splicing clip and then close the clip. If necessary, a pair of pliers can be useful. 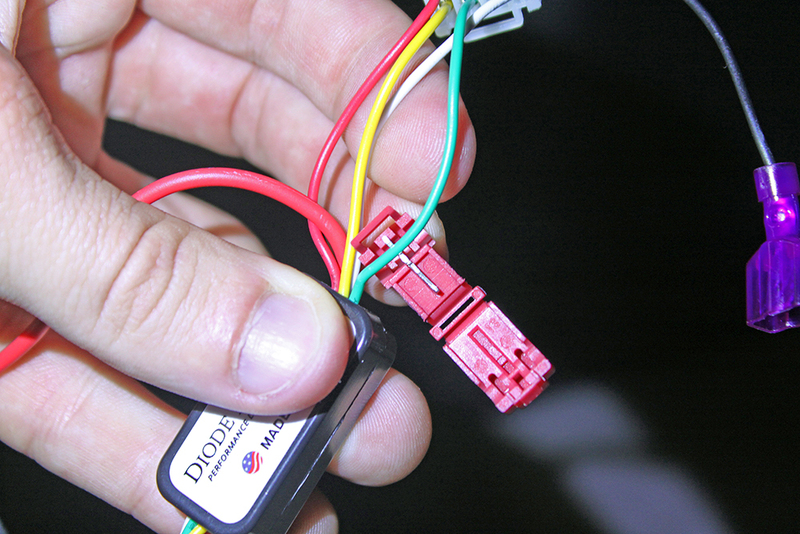 After installing your wire splicing clip, plug the loose wire from your Tail as Turn Module into the clip. Plug in your module to the tail light input and plug the existing wiring harness for the rear tail light into your module. Now you will want to get someone to assist you with testing out your new LED bulb and module. First check to see if the brake light works as both a brake light and turn signal. After verifying this, have someone place the vehicle in reverse. 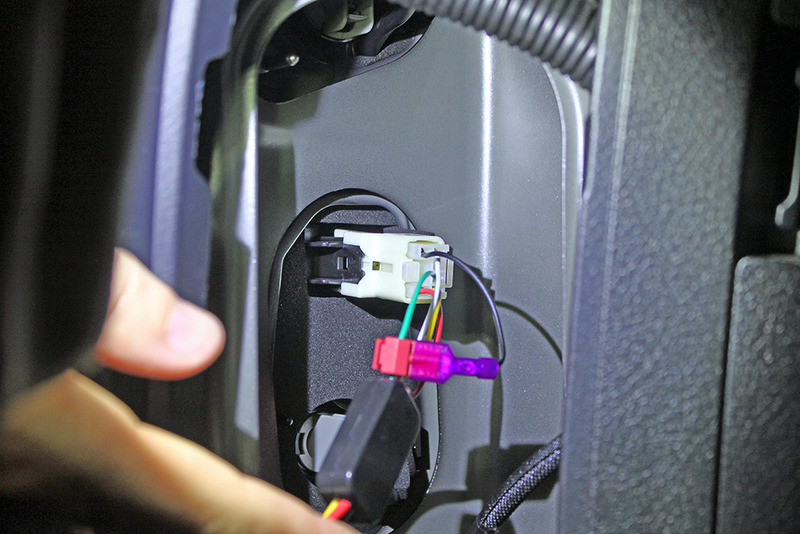 If the LED that you have plugged in to the turn signal wiring lights up, you are good to go. If not, you simply need unplug the bulb and rotate it 180 degrees. After verifying the polarity is correct on your new LED bulb, place the bulb back into its location and turn the assembly clockwise to lock in place. I will note that the wiring for the turn signal bulb (now your extra reverse bulb) is extremely short. You will really have to be patient and slowly maneuver your new LED bulb into location. This was by far the most difficult aspect of this install. Take your time…it can be done. Replace the cover to your rear taillight assembly and repeat these nine steps for the other taillight. The Diode Dynamics Tail as Turn Module can drastically improve your 4Runner’s reverse lighting in both performance and aesthetics. Although this is not the cheapest install, you are getting quality parts that will last and you are also supporting the USA! I think that the value of this install would not be as good if you didn’t go with the XP80 bulbs and therefore I highly suggest spending the extra money on getting the top of the line LED bulbs to complete your Tail as Turn Module. 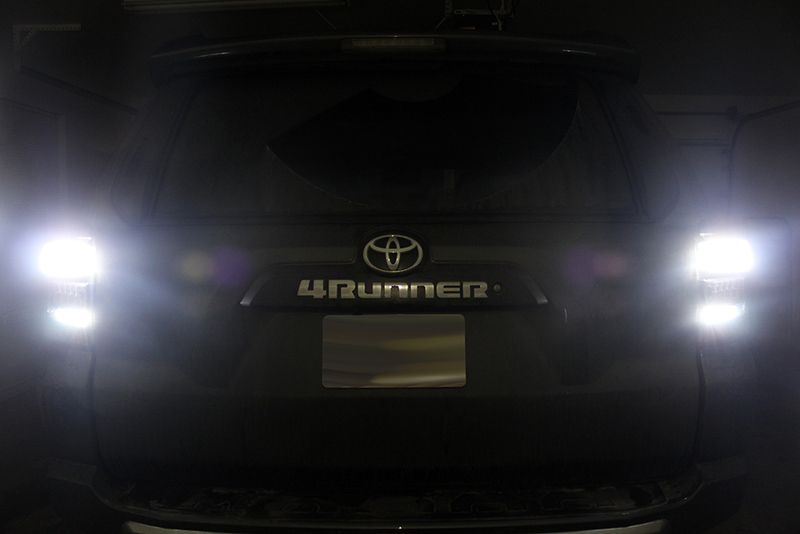 It is also well worth your money to upgrade your stock reverse bulbs to LEDs. By doing so, you will have a unique look when reversing, as there will be four reverse lights. You will also have a completely LED tail light assembly. In conclusion, the Diode Dynamics Tail as Turn Module with upgraded reverse bulbs not only improves the performance of your reverse lighting but also your safety and visual appeal of your vehicle. 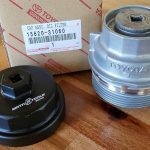 There are a lot of lighting upgrades you can do to your 5th Gen 4Runner, and I highly recommend adding the Diode Dynamics Turn as Tail Module to your list. 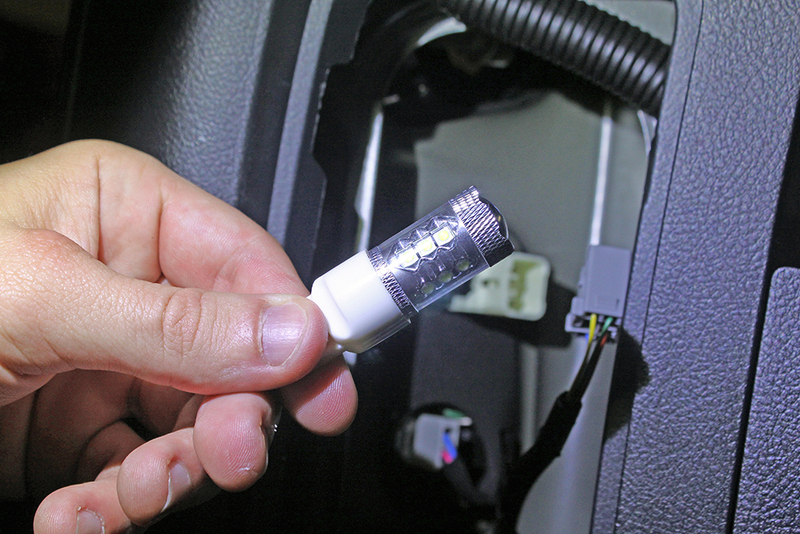 Swapping out bulbs in any car with non-CAN bus bulbs when required may lead to problems. I saw no mention of this in this post nor on the Amazon site for the XP80 bulb. 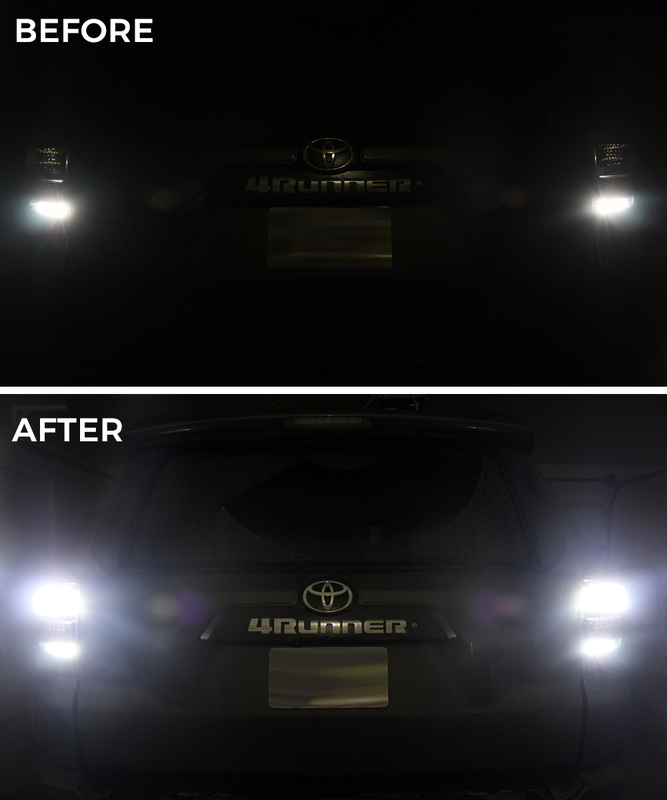 On superbrightleds.com the vehicle specific lights available make the CAN bus issue a lot easier, as it can be very difficult to know when you can “cheat.” If anyone knows where you can find the detailed info on which bulbs need to be CAN bus types on the 4Runner, I would really like to know! @Clintkayaks, this is nice and I am glad it worked out for you. I live in VA and I would be concerned using white for turn signals rather than the amber. I do have LEDs on my minivan and I was thinking about an alternative on my 4Runner. I recently stumbled on the ChisFix install on auxiliary lights which he tapped into the reverse lights (https://www.youtube.com/watch?v=ZVG7X-ae298). He used the same BajaDesigns (BD) lights as the Fog light example on this website. I think I may consider that as I love how the effect of those BD. In his example he just let the lights hang under the bumper which I would be concerned of getting those BD damaged. If I can figure out a more secure housing light the front then I would do that. But again I appreciate your mod. Shaf, this modification does not use white light for the turn signals, it uses amber. Essentially, you turn your existing brake light into a turn signal as well. 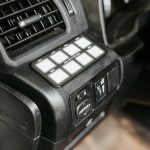 Many modern cars already utilize this setup. The location of the stock turn signal bulb can therefor be replaced with a white LED that only comes on when you are in reverse. This said, you gain an additional reverse light and you turn your existing brake light into a turn signal as well. Turn signals will be amber, and reverse lighting will be white. Thanks for explaining. I was confused and thought I was losing the amber turn lights.. So, the existing brake light has two colors (white and the red). Perhaps if there was an accompanied video that cycles threw all the variations of the signal/reverse/brake lights would help its context. I will look into this mod. I think you are still a little confused. The brake light only has one color – amber. This module makes your break light also act as a turn signal too, so therefore the turn signal will be amber as well. The extra reverse light is where the turn signal used to be, however, since the brake light is converted to serve as a brake light as well, you can replace the old turn signal bulb with a white LED so that you essentially have four (4) reverse lights. You are right I am confused. I like using three colors for each action instead of two. My preference is keeping the yellow as turn signals but adding the extra white for reverse. This way I can keep the turn signals in their original configuration. I understand there are vehicles that use the red as turn signals. Misleading post. This item, installed as suggested, eliminates the amber turn signal and with a white bulb installed (instead of the OEM amber) operates it as a reverse light ONLY. This item makes the existing red tail/stop lamps act as tail/stop/turn signals. One has to decide which is more important, a brighter reverse light, or a smaller red, rather than amber, turn signal. Where and how did you mount the load resistor? I ended up using some 3m sticky back Velcro strips away from all the wiring. I am just wondering what other folks are doing because of the heat. Should I use self tapping screws and mount directly to the metal? Thanks. I also used some 3M adhesive tape and mounted the resistors to the rear “quarter panels”. I wouldn’t use self tapping screws, as the adhesive tape should be more than enough. Just make sure to clean both the resistor and the adhering surface. 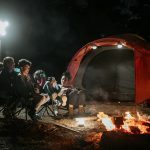 how many of you guys have bought the xp80 bulbs ( worth it?) and how many have bought different bulbs (which ones did you go with?)? Thanks! If running led bulbs on a 2013 does this mod work? Wiring looks relatively the same. Has anyone tried? It does work btw for anyone that is wondering. Did you replace the Brake lights with upgraded LEDs? Shell, no the brake lights are just the stock LEDs from the factory. Yes I did. I personally just went with whatever LEDs O’Reilly’s carries and it works very well. I love it. If you want to upgrade the third taillight too this is the one I got but its tinted and it works/looks well/good. Find it here. 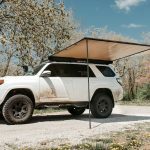 Is there a kit for 2012 Trail Edition? I am noticing that this is only 2014 +. Pretty cool mod, though!! Not that I know of, you might try contacting Diode Dynamics directly. They have very good customer support and might be able to help you out. OK, thanks, I’ll give that a shot. Installed both the mod and new XP80 bulbs on my 2019 TRD ORP and I couldn’t be happier with the extended lighting. This writeup gives step by step much better than DD’s instructions “Didn’t remove the lens” and just about an hour, now to go do some backing up! Matt, awesome news! 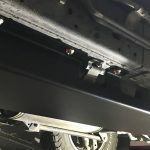 This install is one of my favorite modifications I’ve done and I’m glad the article helped you out! Clint, you should do a review on the Orange Virus tune. It’s a ECU and TCU flash tune but looks very interesting. I put this in my 2018 TDR Pro 4runner and the right side worked perfectly. The left side turn signal did not work. 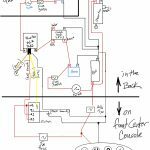 The left reverse and brake light works and the stock left turn works so I know the problem is in the diode or their wire harness. I’ve put in a message to the company. 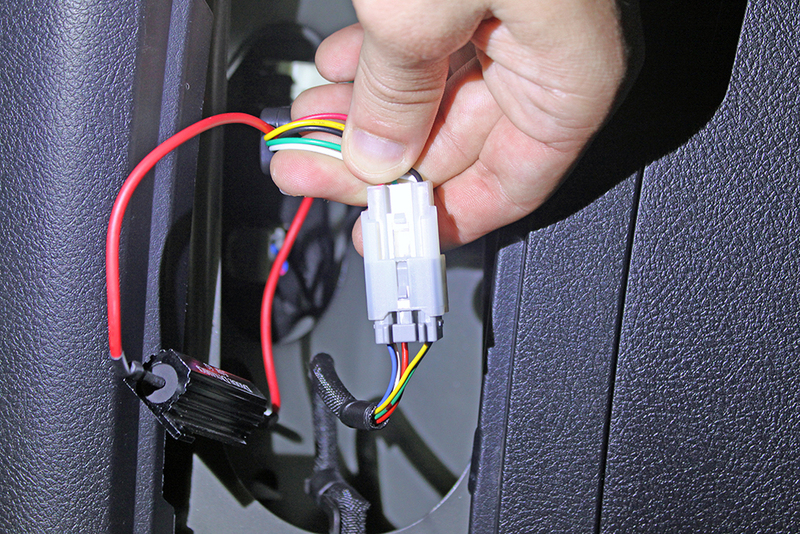 Don’t VHB tape the diode to the car until you are sure everything works. Ask me how I know. The same thing is happening to me as I type this. Have you heard back from the company?